Note: download fresh releases at least once a week during early beta development stage. You should have Microsoft .NET Framework Version 2.0 Redistributable Package Installed on your computer to run HTTP Tunnel Geinus executable. Local HTTP Proxy starts at: 127.0.0.1:1978 address. Please let me know (httptunnelgenius@gmail.com) which software you want to use with this application and I will try to implement support for all of them. 04/13/2013 - Made changes related to changing hosting provider. 04/13/2009 - Fixed minor bugs related to auto detection of connection settings. 05/26/2008 - Fixed minor bugs related to fresh proxy list downloading from various locations. 05/24/2008 - Recently Because of increased popularity of HTTP Tunnel Genius software our site appeared in the lists of a majority content filtering software's in the "Anonymizers" category, which was blocking HTTP Tunnel Genius software to download fresh proxy lists from our server, earlier we come up with offline proxy list solution but in the latest update we added possibility to download fresh proxy server list from various locations, so it doesn't matter now if your university/school/company/provider is blocking httptunnel.ge or not, HTTP Tunnel Genius software will be getting fresh proxy servers list anyway!!! 05/16/2008 - Added Tunnel Proxy List Settings, now you can specify what kind of tunnel proxy servers you want to download, there is few groups of settings, first is proxy transparency mode such as Transparent, Anonymous & Elite (High Anonymity) proxies, second option is port, for example if you know that your proxy/firewall is blocking port 3128 for any connection than you can simply uncheck that option and your list will be filtered against proxy servers on 3128 port, and the last option is proxy server speed, you can specify one of following options: All - you will have proxyes of all speeds, Recommended - your list will be filtered against slow proxy servers. 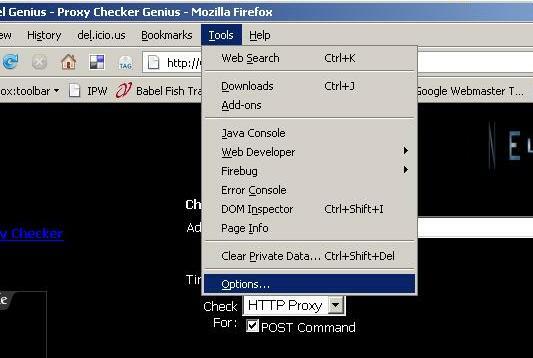 and Only Fast - in this case you will have only fast servers in your proxy list. Select the Options from the Tools menu. 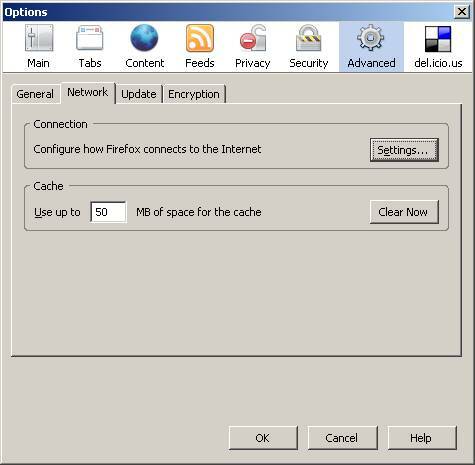 Go to Advanced -> Network and Click Settings. 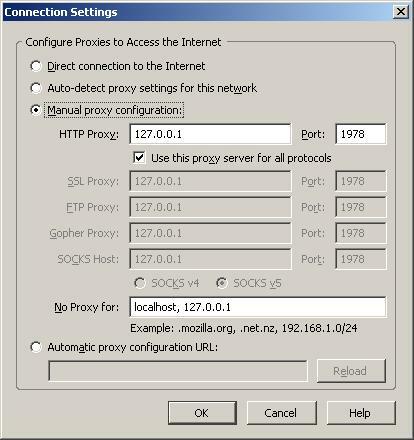 Select Manual Proxy Configuration; enter 127.0.0.1 in HTTP Proxy and 1978 in Port.